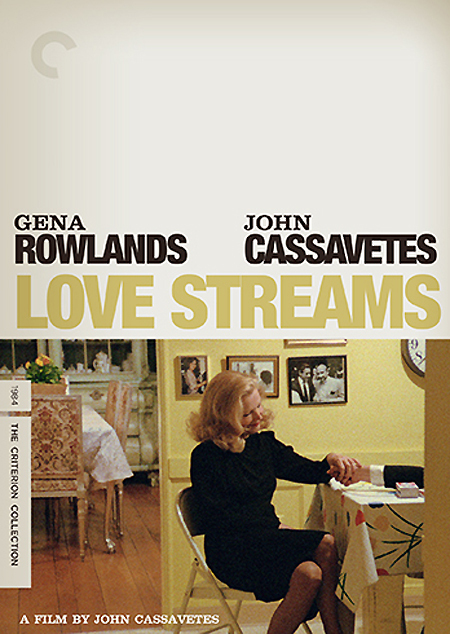 May | 2014 | Dave Andrae's "Blog"
A couple of hours ago it was officially announced that the Criterion Collection will finally reissue John Cassavetes’s charming, emotionally complex swansong Love Streams. This is wonderful news as fans of the neglected masterpiece have been waiting patiently for a North American home release that markedly surpasses the quality of the original VHS and BETA tapes, now almost thirty years old and long-out-of-print. It feels as if film lovers with an eccentric bent have collectively won the lottery, and it’s great to know that throngs of people who have never experienced the film before will now have a chance to see it. I’ve managed to catch Love Streams a couple of times in the theater, first during a Cassavetes retrospective at the Gene Siskel Film Center in Chicago, and a few years later during a similar retrospective at the now-defunct (and genuinely missed) Oak Street Theater in Minneapolis. This was roughly around the time when Cassavetes’s work as a director started to experience a significant reappraisal and resurgence in popularity. Offhand I forget the chronology, but in a fairly short period of time Ray Carney’s book Cassavetes on Cassavetes was published (a little while after Tom Charity’s book about him); Cassavetes was honored by being featured on a stamp by the U.S. Postal Service; the Criterion Collection put out a DVD boxset of five of Cassavetes’s independently-produced films (accompanied by a somewhat tepid and fluffy documentary made around the same time); and in general more and more people in the film world (famous directors and actors, critics, programmers, cinephiles, “bloggers,” you name it) were coming out of the woodwork talking and writing about the artist and his creative legacy. But in the midst of all of this “hoopla” it never sat right that Cassavetes’s last truly personal feature-length movie, and probably his most melancholic effort as both a director and actor (he made the film while he was dying after all), was only seen publicly via warped and tattered prints almost as old as I was. Seeing the film in 35mm, on the big screen, it definitely resonated more than it did at home, but for a while there it started to seem as if Love Streams would never resurface in the 21st Century in some sort of restored form that would take advantage of advancements in technology. So yes, to reiterate my point, I’m really grateful for this upcoming release and suspect a lot of others viewers out there are too.